Most of our layouts start with photos, right? And most of us could use a little encouragement to stretch our photography skills, right? 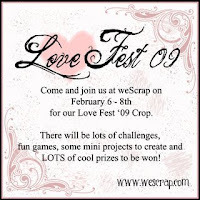 ...my first challenge for you is to submit photos to the WeScrap Love Fest gallery for at least 5 of the following word prompts. Clearly some words lend themselves to more literal interpretations, while others are more abstract - some could go either way. However you decide to capture the word in the form of a photo...just be creative! For official rules & instructions on how to earn a ballot towards the prize drawings for this challenge, see my forum post. Be sure to check out WeScrap forums and gallery this weekend...it'll be a fun place for sure. In addition to the challenges and game I will be posted over the next couple of days, there are 10 other Inspiration Team members posting all kinds of inspiring and fun challenges, games and make-n-takes throughout the weekend! !